Frederick Charles Adams was my grandfather. I have created this website to help clarify the relationships of people who appear in his diaries and photographs published elsewhere. The tree on this page and the following Morse and Sartwell pages show relatives he knew, or knew of, during his lifetime. Fred was born in Boston MA in 1873 and spent his first 32 years there before moving to the West Coast. He moved back and forth between Bellingham and Whidbey Island WA and Pasadena CA before settling in Los Angeles in the 1920's. 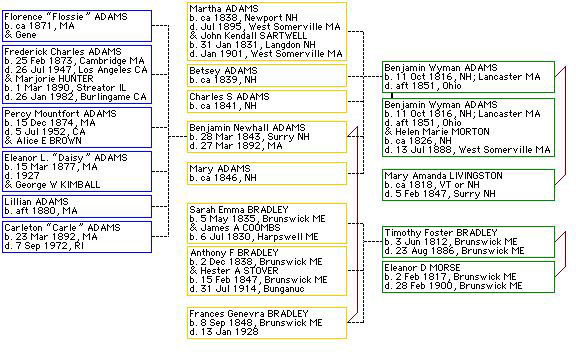 The additional pages are his ancestral genealogical lines which I include for whatever interest or use to others they may have. I hope to be able to extend them and will update them as I learn more. I look forward to sharing information about people mentioned here. I welcome questions, additions, corrections, comments, etc.